Community Connections – Our Stories Matter…. Compassion is no foreign concept to the children of Family Scholar House. Even if, as is true for many of them, there has often been a lack of it in their lives, they still possess hearts very open to expressing their desire that the world be a more compassionate and kind place. They’ve known hunger and violence and lack of safe shelter and other effects of generational poverty–they know what it looks like when compassion is missing. And we can almost always count on them to also have a vision of what it’s like when compassion is present, all the time, every day. And it’s important to us at FSH that our children are given opportunities to express that. First, we got involved with Compassionate Louisville. 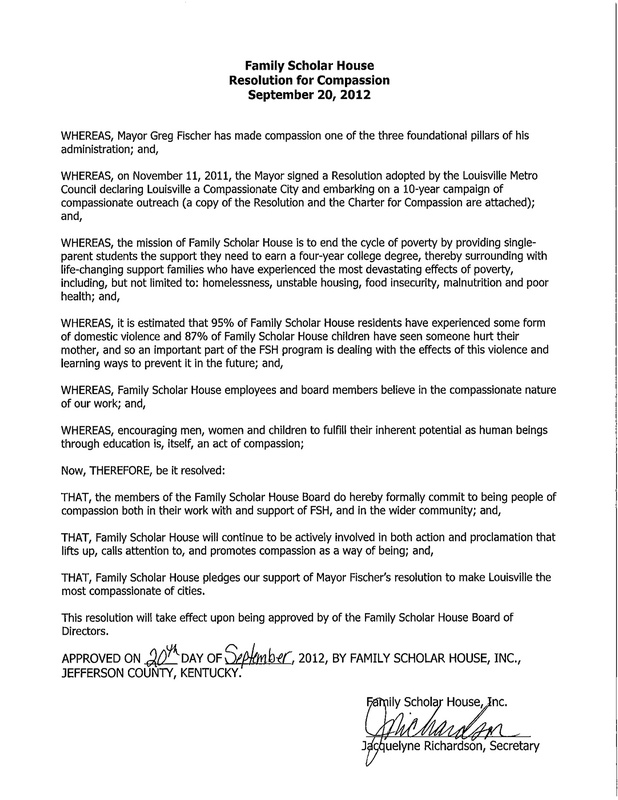 Then, we wrote our own Family Scholar House Charter for Compassion. A couple of months go we had our children participate in the Peace Postcards project. And now, this spring, our children are invited to “sign” (via hand print) a Children’s Charter of Compassion. You can read more about the Children’s Charter for Compassion here. Our children will be signing a simple version of this beautiful charter with their hand prints–unique to them, and an indication of how special they each are in their own right. Our children are showing the way–and we know that listening to them will help us all have a better future. I lead a Missional Community that has focused its efforts on Family Scholar House. The partnership between The Avenue and Family Scholar House is natural as we are neighbors separated by two blocks. Our group has done things like host movie nights for residents, help sort clothing donations, write letters of encouragement to residents, bake cookies and help with the fall festival. Each time we serve, I believe that we get more out of it than the organization does- as the group leaves hopeful and encouraged. Single parents are one of the most overlooked subsets of our society. Looking at it objectively, we do not make it easy for someone to raise a child(ren), have a career, and make a positive impact on the world around them. It becomes infinitely more difficult when you add “full-time student” into this equation. This is why I believe the work that is done at Family Scholar House is so revolutionary. Education is a key to breaking the cycle of poverty and Family Scholar House does this more effectively than any organization I have been in contact with. 1) Pray for Family Scholar House- its residents and staff. 2) Write a note of encouragement for a resident. You never know how a simple thing like a handwritten note will make its way to a resident at just the precise time a pick me up is needed. 3) Give of your time one day per month for two hours. I promise that you will walk away encouraged. Thanks, JT, for your words–and thanks to ALL the folks over at The Avenue for all the ways you are helping us fulfill our mission! At first glance, it’s your typical networking party in a city that does those better than anyone around. Young professionals wearing the latest fashions, business cards discreetly at the ready. Carefully selected music playing. The smells of creatively designed and produced, locally-sourced foods beckoning you further inside one of the grand rooms at the Henry Clay. Artisan ice cream in one corner, baked goods that are nothing less than sheer poetry in another, and all along the sides, tables of sushi-inspired creations by Louisville’s finest chefs. There’s laughter and chatter and folks moving about in the dance of getting to know one another, making connections, renewing acquaintances, and forging new friendships. It’s Sushi in the City, a Family Scholar House fundraiser designed to show off the very best Louisville has to offer in dining all while helping our city’s younger professionals meet-and-greet and share their support of FSH. And at first you might think, “Been there. Done that. This looks like all the rest.” Only it isn’t like all the rest–not quite. Because among all those who fit right in are those who normally don’t. 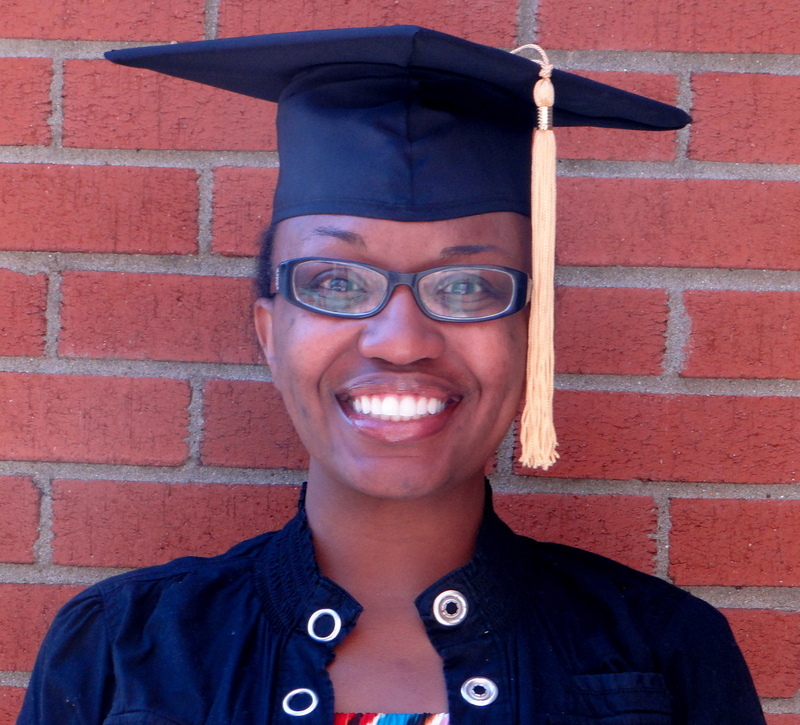 Among all those swirling personalities are the men and women of Family Scholar House–full-time single moms and dads who are also full-time scholars, pursuing a college degree. They’ve got stories to tell you of heartache and loss, of poverty and violence, of what it means to have to start over when you aren’t even sure where the starting line is or where you got knocked off the track to begin with. They’ve got perseverance and determination and triumph–and they ARE the reason for the party. And the thing is? Unless someone tells you otherwise, you won’t know the difference–nor should you. Because the participants in Family Scholar House have dreams just like everyone else in the room. Dreams of a secure professional life that leaves them fulfilled, dreams of a home and a safe family life, dreams of their children soaring into whatever beauty they want to make out of their lives. Yes–Sushi in the City raises money for Family Scholar House. And yes, at Sushi in the City, networking happens. But even more? The playing field gets leveled a bit–in the very best and most hopeful of ways. And it becomes apparent, if you’re paying attention, that really there isn’t that much difference in us all, after all. We are blessed here at Family Scholar House to be welcomed into Amelia Place (the official residence of the President of the University of Louisville) every year for a gigantic Halloween Party, and we’re grateful to Dr. and Mrs. Ramsey for their gracious hospitality. It’s quite a scene, this party, and you can’t help but leave with a buoyant spirit and twinkling eyes. For this fun evening for our families, we are thankful. And out of it, as you’ll read below, can come some amazing things. Imagine, if you will, masses of children running around a lovely, historic and spacious home. These children are all in costume and so you’re just as likely to see Buzz Lightyear dash by as you are Rapunzel or Spiderman. There’s pizza galore, accompanied by trays of cupcakes and cookies and candy corn. Fabulous decorations–right down to mechanical rats and a talking witch–adorn the walls and fill up corners, and in one room a magician works to pull a flower out of the ear of a particularly brave five year-old while her peers look on in amazement. Laughter is abundant, as are squeals of delight. And even the littlest ones offer shy smiles at the happy chaos all around them. Moms and dads stand back, grinning at their children and catching up with one another. It’s loud. And bright and wild and messy in the way children’s parties always are. In a front room, next to a wide window looking out over the Amelia Place lawn, sits a baby grand piano. And around it are children vying for their turn to bang out quickly constructed and jangling melodies. Into this fray comes one of the FSH single dads. He smiles at it all and then leans over the child currently at the piano bench–his son–and his big and gentle frame sort of takes over the scene. As he places his hands on the keys, it is apparent something more than banging is about to happen. And it does–suddenly over all the noise come lush notes. Intricate harmonies. Music that makes anyone within hearing distance stop what they’re doing and turn towards this something so beautiful. Spend any amount of time at Family Scholar House, and you’ll know that within its walls dwell the remnants of broken lives. The families who live here have survived some of the very worst life can mete out and are headed into new and more whole realities–but the ghosts of what has been are always with them. And then, sometimes, an unexpected piece of music–the kind so beautiful it makes your heart ache–comes working its warmth among us all, and in between the notes of it arrive new ways of doing and living and being. Out of despair comes hope. Out of desperation comes confidence and determination. Out of pain comes healing. Out of not knowing where to turn next comes a community to lean into and to trust. Out of all the darkness comes something beautiful. And in these moments, we breathe a collective “thank you,” for everything that makes the something beautiful happen. “What does compassion mean to you?” the intern asked. The resident thought for a minute and asked, “Can I get back to you on that?” A few days later, came this response, “Here’s what compassion means to me,” the email began, and attached, the intern found a picture of the resident’s children, sitting together, being brothers, reading. It isn’t world-changing, but then again, maybe it is. After all, domestic violence is an all-too-well-known reality for the majority of Family Scholar House residents. Add to this the experiences with homelessness, poverty, inadequate medical care, and food insecurity that many FSH participants have known, and it’s no wonder that for this resident, her two boys sitting quietly and safely and kindly in their home, on a couch together, is an expression of the compassion at work in her life. 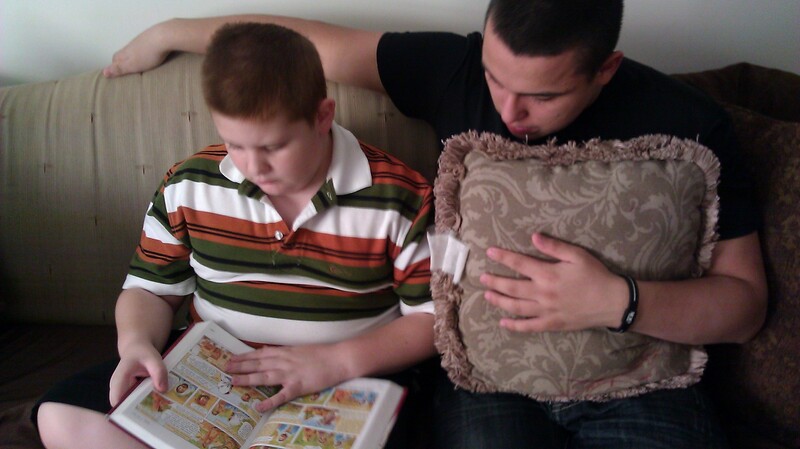 Compassion is part and parcel of who we are, what we say, and how we act here at Family Scholar House. And although this has been true since our inception, the FSH Board recently took things a step further, approving an official board resolution as a sign of support for the Compassionate Louisville movement. The resolution is below. Our tremendous thanks to the Board for making such a public statement of who we are at FSH. And our even deeper thanks to the families of FSH, who are, so very often, personifications of compassion themselves. Now, therefore, be it resolved! They don’t look like much–after all, they can be purchased just about anywhere from the supermarket to an office supply store, and they are often given away as trinkets from recruiting events or college and career fairs. But this particular batch of “jump drives” is special. A few weeks ago, first-year students from the University of Louisville Brandeis School of Law came over to FSH’s Stoddard Johnston campus. About ten students and two faculty members spent the morning organizing school supplies for FSH children. They took inventory, filled requests from families, and organized what was left into donation boxes for single-parent students in FSH’s pre-residential program. It didn’t take them long to determine that none of them really needed their jump drives–sure, they were helpful, and they were glad for them–but they all had laptops and iPads and cell phones and really, if they needed a jump drive, they could probably afford to buy their own. Of course we can. Especially for our pre-residential students who may not have computer access other than a library or the FSH computer lab or their school’s lab. Things such as jump drives are an extra expense that FSH families often can’t afford. 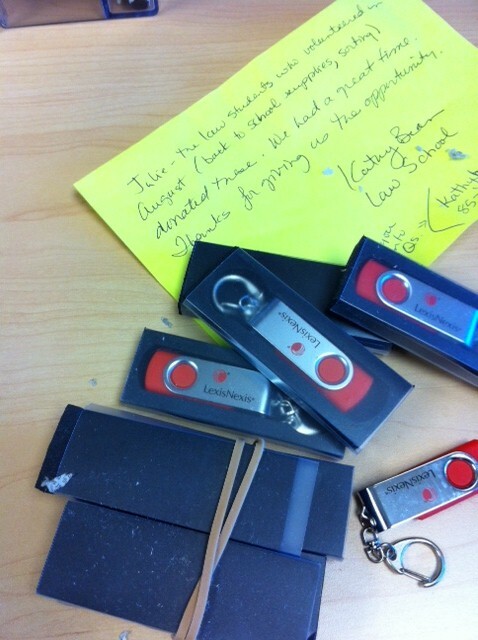 So this batch of jump drives–arriving at FSH in a padded mailing envelope and with a note inside expressing thanks that the drives could be put to good use–is special. They are symbols of a connection made, of new learning and a willingness to share. They are indicative of new community. They are a sign of what Family Scholar House is all about–pulling together, supporting one another’s efforts, and circling those in need with our best selves, so that we all might be stronger. July 11th brought both a break in the triple-digit temps we’ve had here in Louisville lately, and a fabulous child-centered event on our Stoddard Johnston Scholar House campus sponsored by our good friends at Texas Roadhouse. The Family Scholar House/Texas Roadhouse Pet Show gave cause for FSH kiddos to come together for an afternoon of games, snacks, crafts and activities. 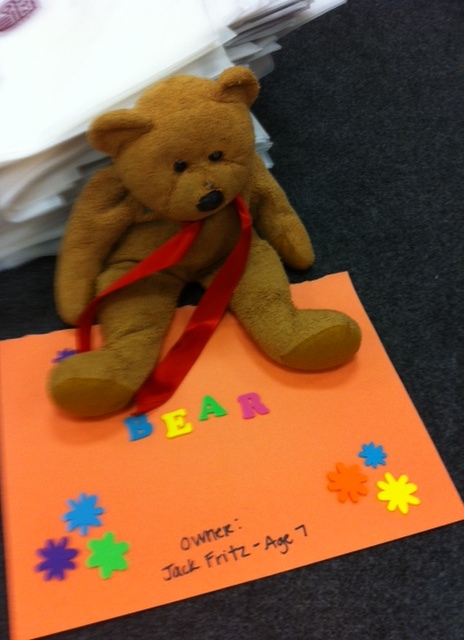 Participants were invited to choose a stuffed animal from home or “adopt” one from donations provided to FSH, and then name their “pet,” write a story about their pet if they so desired, and bring it to the Pet Show to show-and-tell about. There were stuffed orangutans, leopards, exotic birds, dogs, wolves, kittens, bears and fish galore! 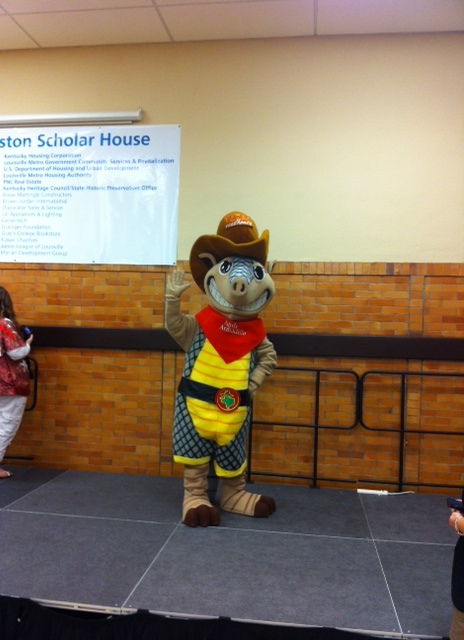 Andy the Armadillo, TR’s friendly mascot, was on hand as well to take pictures with the kids and hear all about their pets. There’s nothing quite like giant Andy hugging a little stuffed fish to his chest while the fish’s three year-old caretaker squeals with glee! We were also privileged to have on hand the youth group from Buechel Park Baptist Church–these amazing volunteers sang songs, played games and provided supervised playground time for FSH kids as they came and went from the Pet Show. It’s safe to say both the youth group and our kids had a great time together! For strong community partners like Texas Roadhouse, we’re grateful (it was legendary, ya’ll!). For mission-minded groups like Buechel Park, we are also thankful. Way to go, everyone! FSH children were ALL winners–celebrated, empowered, and entertained, every one of them! No one knew that 100+, recording-breaking temperatures would descend upon the city of Louisville when plans were first made for Field Day at Stoddard Johnston and Stone Soup at Louisville Scholar House. But so they did, and that meant it wasn’t the sort of day any one wanted to do much of anything at all, much less get outdoors, get moving and get cooking with friends and neighbors. 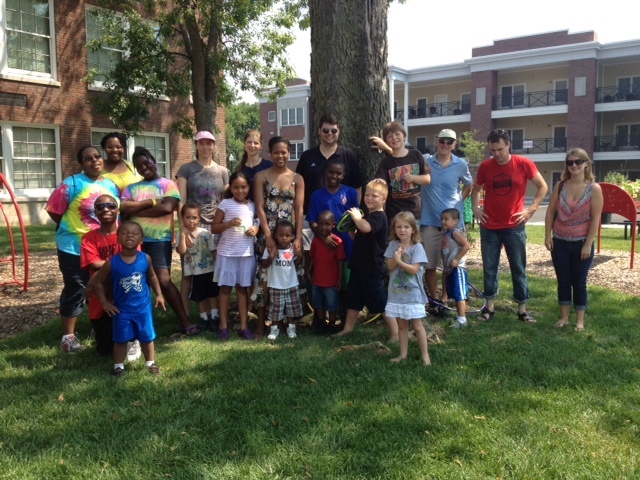 Families from Stoddard Johnston Scholar House and community volunteers take a break after a very warm Field Day! Still, some brave souls gathered at SJSH, along with some fabulous volunteers, to spend the morning playing games, engaging in friendly competition, and being reminded that part of healthy living is keeping active. That evening, another group of participants and volunteers came together for a lesson in cooking and community with Chef Hank Leavitt and the team from Stone Soup, an organization dedicated to cooperative, healthy, sustaining practices in food growth, production and preparation. One lucky participant went home with a new crock-pot and a few more received new cookbooks. All of them left with leftovers: veggie-full pasta salad, homemade dips for raw vegetables, fresh watermelon and peach crisp. 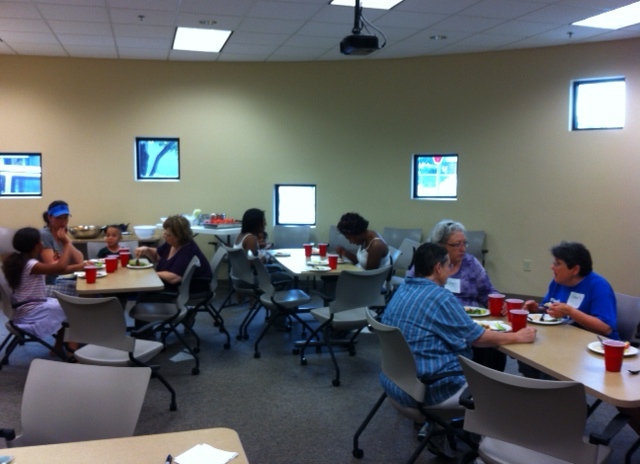 Community members and Family Scholar House residents gather for Stone Soup. Both the Field Day and the Stone Soup event meant children, adults, staff, participants, volunteers all together, all striving for good health and all learning from both the event itself and one another. Our thanks to Adam Price, Charlie Bird and Joey Beatty, Field Day volunteers, and to Hank Leavitt and his Stone Soup Team–wonderful supporters all! In November of 2011, Louisville’s Mayor Greg Fischer signed a resolution committing to a ten year “Compassionate Louisville” campaign, making our city the largest one in America to be marked as an international city of compassion. You can learn more about the resolution, the Charter for Compassion, and how Louisville will live up to its new responsibilities here. We have committed to hosting two conversations, and the first took place on Thursday, June 28th, at Maupin Elementary School in the Parkland neighborhood. In a corner of the elementary school’s cafeteria, with water, coffee and baked goods on hand, and eager voices ready to share, FSH staff members Julie Richardson Brown and Harvetta Ray, along with Mr. Mason, listened to the concerns and hopes and commitments of eight neighborhood community leaders. These men and women care–in every sense of the word. In the face of violence and crime and poverty in their neighborhood, they want peace, stability, wholeness, and they are ready to work for it–hard. Their care was evident in every word they spoke, and their willingness to do whatever needs doing even more plain. They are people of compassion–already–and likely some of our city’s greatest treasures when it comes to actually living out what it means to be compassion. Personal responsibility. Accountability. Respect. Cooperative efforts. Presence. These are some of the words they used–over and over–in talking about living from a place of compassion. Loving one another as we love ourselves–that’s everything, they said. They were a small but mighty group, and they exemplified the truths that we hold dear at Family Scholar House–that we are stronger together, that taking care of each other is part and parcel of living, and that when people have choices–real, available, good choices, they generally make the right choice. We’re thankful for the opportunity to be part of a Compassionate Louisville. And we invite you to join us–in whatever way you can–as we live into a more compassionate future. Our special thanks to Councilwoman Attica Scott, Maupin Elementary principal Terri Davenport, and Arthur Cox of St. George’s Community Center for their support of the World Cafe Experience. We’re grateful. tonight to represent the Family Scholar House class of 2012. I stand here as one story of many. Our stories differ, some will make you cry, some will make you think, others may make you laugh, and unfortunately, some may make you cringe. Our stories are what brought us here, but that is not where our stories end. With the support and guidance that we have received from FSH, we hope that our stories will now inspire you, encourage you and motivate you. Before I address the graduates I would like to thank a few people who have helped us collectively, and me personally. First, I would like to thank Cathe Dykstra. To some of you she is simply the President and CEO of FSH but to us she is more. If you ask Cathe how many children she has her response will be “over 600.” She is referring to number of families FSH serves. Cathe is a visionary. I am thankful for her vision, her dedication and her determination to see that this program is not only successful but that it thrives. She is a mother in the fullest sense and she does not play about her children. I love you Cathe. Not because of the early morning trips to radio stations, television studios or newspaper interviews or the late night galas and fundraisers or the midday tours of my apartment, but because of the advocacy, the long and often late nights, and the miles you have put on many pairs of really cute shoes to ensure that we have what we need to succeed. Second, I would like to thank the all of the staff, interns and volunteers. We thank you for all of the late nights, the workshops, the events, the phone calls, the meetings and definitely the child care. We don’t know if you knew what you were signing up for when you accepted this job, but we hope it has been as rewarding for you as it has been for us. If we have not said it enough: thank you, thank you, thank you! Over time I learned that these people were willing to give of their time, talents, finances and resources. We’ve had mentors, life coaches, cooking classes, financial and homeownership workshops, adoption of our families for Christmas so that our children have presents to open, Thanksgiving and Mother’s Day dinners, exercise and chess classes, book clubs, food, clothing and household items…the list goes on and on and on. I am also thankful for the lasting relationships I have built from these connections. You have served us well and we hope that our accomplishments today have been worth your investments. We would also like to thank the faculty and staff of the various high schools, colleges and universities we represent. Thank you for understanding the complexity of our situations, yet still challenging us to excel. Many of you have been asked to be here specifically because you have impacted our life beyond the classroom. There was something you did or said or shared that motivated us to move forward. Thank you. I am particularly partial to my advisor and professors from the University of Louisville Kent School of Social Work…GO CARDS. To our family and friends: We could not have done this without your support and encouragement. Whatever capacity you have served, whether it was watching our kids so that we could finish a paper or encouraging us when we were overwhelmed, just listening, or recognizing when we needed a laugh and to get out and have some fun, we appreciate you. I love you Mom, and I would like to ask my daughters Kennedi and Nadia to stand up, and all the children of FSH residents: We would not be here if it were not for you. You are our inspiration and motivation. We thank you for your understanding and we have depended on your resiliency and flexibility. You have had to sacrifice right along with us. You have gone to bed early so that we could study and finish assignment,s and sometimes had to give up doing something fun because we needed to work or study. Thank you for being right here with us. And now to the graduates: You have already heard or will hear many motivational messages at your commencement ceremonies. I must admit I had no idea what to say to you, I even googled “How to write a graduation speech” and even though they gave good pointers, there was nothing out there that captured this particular set of graduates. We are unique. We have defied the odds, overcome societal and cultural stigma, and many other obstacles and challenges and we have done it well. Whatever brought you here, whether it was divorce, homelessness, abuse or just a series of unfortunate events, we have overcome. My encouragement to you is to keep going. If you have earned your high school diploma continue to higher education, if you have earned your Associates, go for your Bachelor, if you have earned your Bachelor go for your Masters, if you have earned you Masters go for your Doctorate! If you are going into employment go in confidently. No one can take away this achievement, it is ours. I hope that you all feel the same confidence and value that this achievement has added to my life. Let’s go out and do great things, and always remember you are an ambassador for Family Scholar House. Share your stories and your successes so that you may be the one person in someone else’s life who may need to hear about this. Most importantly, remember to come back and give back in some capacity. It is our responsibility now to ensure the lasting success of this program. I really don’t have much else to say except “Congratulations!” and the infamous…WE DID IT! Thank you!